To know if a car is truly and honestly Meh, you have to very carefully gauge your reaction to thinking about the car in question. Specifically, if you have any reaction at all, the car is not a Meh car. A Meh car is an inert, noble gas, like argon, something that accomplishes its fundamental job while affecting almost nothing around it. The third-gen Hyundai XG350 is, in this sense, a truly noble gas. 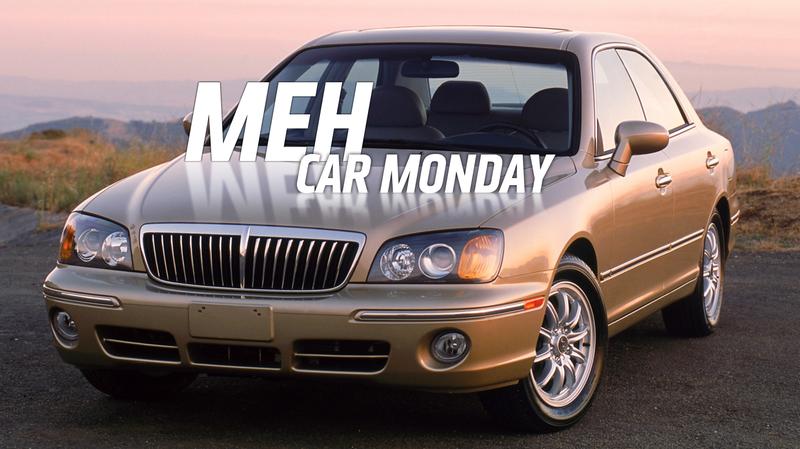 I feel like it’s worth re-iterating that the cars selected for Meh Car Monday are not, by any means, terrible cars. Terrible cars are interesting. That’s why I can’t in good conscience, make the Morris Marina a Meh Car Monday car, even though a reader named Adam sent me a fantastic email all about the Morris Marina, which is just, sadly, too miserable a vehicle to be a Meh car. If someone I knew had a Marina, I’d desperately want to see it, drive it, experience the grand failure of it all. But a Meh car? No one cares. There may be a shiny metallic-caulk-colored Huyndai XG350 sitting right outside my house this very second and I’m not really sure it’d be worth me finding my shoes to go see it. The Hyundai XG350 was Hyundai’s pre-Equus attempt at a luxury car, and the third-gen one was the first time they’d developed it all on their own. Previous Hyundai luxury cars were re-badged and slightly re-styled Mitsubishi Debonairs. In Hyundai’s home market of South Korea, these were called the Hyundai Grandeur, but in America of the late ‘90s to, I guess, the present, the thinking was that any premium car worth its Alcantara pelts was named for a jumbled string of letters and numbers. The same platform also gave the world the Kia Amanti, but that can’t be a truly Meh car because the front end styling treatment is such a knockoff of Mercedes-Benzes of the era that it causes me amusement, a sensation no self-respecting Meh car is capable of. The ability to make cold asses slightly warmer was determined to be a selling point of this car to such a degree that an entire commercial was made. Let that sink in. The XG350 was a car that people ended up with, as opposed to wanting. Nobody started the process of seeking out a mid-sized premium car with the letters XG360 in their heads. Or XG350. Did you even notice I made a mistake? I didn’t. People ended up with XG350s because they were a pretty good deal. The base price was about $25,000 back in 2003, a good chunk less than a BMW 3-series sedan, which was closer to about $30,000. It wasn’t like half the cost or anything like that, because, again, that’s too interesting. It was somewhat cheaper, and that was enough for some people to decide, hey, close enough. The car looks like an early 2000s premium-ish car in every possible way, so much that even if the factory made them in colors other than silver or that champagne-color, your brain is just not capable of processing them in any other colors. The supreme, overwhelming blandness of the car is so potent that I bet you could convince a drunk friend that they were an android by showing them one of these cars and asking them how it makes them feel. They will, of course, feel absolutely nothing, which will be enough to make their gin-soaked brains panic that yes, they are some kind of replicant, and then maybe they’ll do something crazy like try to put their hand through some drywall, which you can video and put up on the internet for big laffs. The XG350, then, is like the opposite of the Voight-Kampff test: it makes everyone believe they’re a soul-less, unfeeling replicant. They should have gone with that as the advertising tagline.